Snakes are just one of many species of wildlife that we may encounter during our treks in the wilderness. 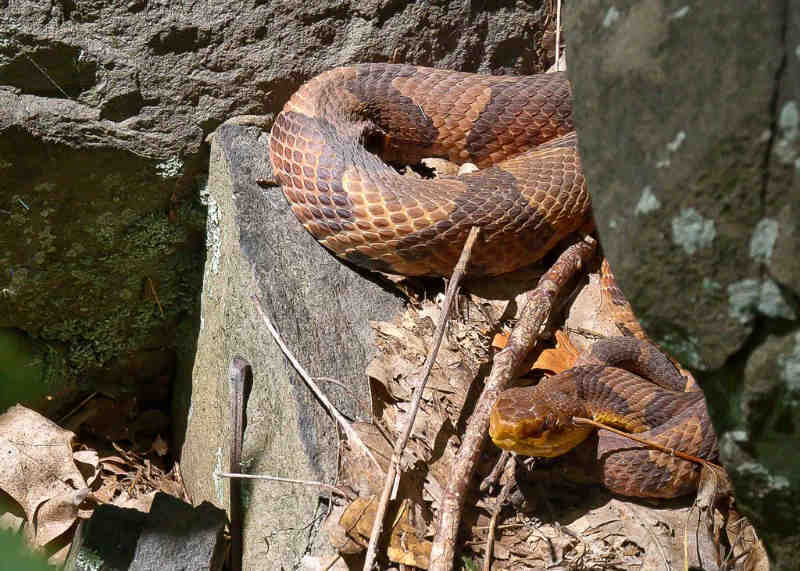 Below are some guidelines to preparedness, understanding how to manage an encounter with a snake, and first aid of snake bites to make your adventure “snake-friendly”. Some snake ecology: Snakes are ectotherms, meaning that they depend on external sources for heat. You’re more likely to find a snake stretched across a trail in the early morning or evening, while during the hottest part of the day, snakes tend to seek shelter under rocks, limbs, and brush to avoid the sun. Snakes can strike across a greater distance if they are coiled, but can attack from any posture. They can strike a distance of half their body length. This means, if you come across a six-foot snake, it can easily attack within a three-foot radius, with ZERO warning! Don’t assume the lack an audible warning (rattle, etc) from the snake means that it is not scared or likely to strike. It’s a good idea to do a little research prior to your hike of what wildlife you may encounter outdoors. What snakes (both venomous and non-venomous) are prevalent to the area? You might want to check with a park ranger prior to your outing or locate a good field guide. It’s also a good idea to wear long pants and thick hiking boots, which can prevent a snake’s fangs from piercing your skin. Stay on the trail out of tall grass, rocks, or any other areas where snakes are likely to be. 2. Responding to a snake on the trail. When snakes are faced with a predator, many species will flee. Some will play dead. If they coil up into an “S” shape, rattle, or writhe around, it’s letting you know that it is scared, telling you to leave them alone, and possibly posing to strike. First, freeze and give it some space. Observe the snake’s reaction. Second, if you’re brave enough, you can determine the species of the snake. (NOT ME! I just assume they are all venomous!) Regardless of its nature, venomous or non-venomous, they are to be treated the same way: LEAVE IT ALONE. Most bites occur when people get too close. The snake will most likely look for an escape route. If it is cornered, back away from it slowly. DO NOT attempt to poke or prod the snake with a stick or other object in an attempt to get it to move out of your way. This will only make the snake more likely to strike. The best solution is to wait until it clears the path. Very rarely are venomous snake bites deadly. Per the Center for Disease Control, of the 7,000-8,000 people in the US bitten by venomous snakes, only 5 will die. -Do your best to stay calm and not panic. Move away from the snake’s striking distance. Keeping your heart rate down can slow the spread of the venom. -If you can identify the species, take note. If you’re not sure of the species, make note of coloring, markings, or take a picture of it to aide health care workers in treatment. -Remove any jewelry or tight clothing from the area before swelling starts. -Take note of the time you were bitten. -If possible, position the wound so that the bite is at or below heart level. -Allow the bite to bleed freely for 15-30 seconds before cleansing the wound, but don’t flush it with water. Cover it with a clean, dry dressing. -Seek medical attention as soon as possible. Hike back slowly (trying to avoid strenuous physical movement/activity) to your vehicle and drive to the nearest hospital. -There have been many suggestions in the past on what to do in the event of a bite. Medical research has found that these treatments can hurt more than help. • Tourniquet application-can cause nerve damage to the limb from reduced blood flow. • Suction Devices/Sucking out venom-Does NOT work and is no longer considered safe. These devices generally do not remove a substantial amount of venom, and if using your mouth, you’ll be transferring the venom into a different part of your body. • Cutting the area to increase blood flow: Does NOT work and really only increases risk of infection. • Do not apply a cold pack. Cold reduces healthy circulation to the area. • Avoid drinking caffeine or alcohol: This can speed your body’s absorption of the venom. Snakes are important members of the ecosystems in which they live. Seeing a snake in its natural habitat can be rewarding and cool to observe. Preparedness and knowledge of what to do in an encounter will keep you protected and your outing moving along without incident! Stacy is the Ambassador for our Alabama chapter. To join her local meetups and discussions through the Alabama chapter, click here.